Default privacy settings often aren’t very private. A tech columnist is back with Round 2 of his clickable guide to improving your privacy on all sorts of devices and online services. Your TV, your cellphone provider and even your LinkedIn account have side hustles in your data. But in many cases, you can opt out – if you know where to look. I dug into a bunch of popular products and services you might not think of as data vacuums or security risks and found their default privacy settings often aren’t very private. So I collected here some common settings you can change to stop giving away so much. Here are clickable instructions for televisions, LinkedIn, Twitter, Yahoo, cellphone carriers and WiFi routers. A clickable guide to fixing the complicated privacy settings from Facebook, Google, Amazon, Microsoft and Apple. What I learned is that despite the rhetoric from tech companies, few actually make it easy to be in control of your data. They hide behind menus as confusing as the floor plan at Ikea. I’m a professional gadget guy, and I found even I’ve gotten tricked into handing over too much by my TV maker and phone service. Many of these companies collect our data so they can sell ads targeted to our specific behaviors and interests. They claim people prefer these kinds of personalized ads – but much more often I hear people complain targeted ads are creepy. You can love technology like I do and still be angry that Silicon Valley is making surveillance the price of using the internet. At the very least, companies should be much more upfront about what they’re doing with our data. I couldn’t get straight answers out of many. Others made avoiding tracking or targeted ads so cumbersome, I couldn’t include them in this list I hope you can complete in half an hour. The steps I outline below are small acts of resistance. But I’m hopeful we can send a message that we’re going to judge products on privacy – and the wise companies will learn to use it as a competitive advantage. Your TV is watching you. Often, default settings (or screens you likely clicked “agree” to during setup) allow smart TVs, streaming boxes and cable services to track significant amounts of personal information. They know what you’re watching and what apps you use. In 2017, TV maker Vizio even had to pay millions to settle complaints from the Federal Trade Commission and the state of New Jersey for collecting this kind of data with users’ knowledge. — Recent smart TVs from Samsung, the best-selling brand, track how you use your TV to target ads that Samsung inserts on menu screens. During setup, the TV encourages you to agree to a bunch of terms of and conditions that include permission for “Interest-based advertisements.” You can say no them, but if you didn’t realize what was going on – or now you’re just not sure – you’ll have to dig into your TV’s settings to stop the tracking. You’ll find similar settings on smart TVs made by LG, Sony and Vizio. — Roku streaming boxes as well as Roku-branded TVs made by TCL, Hisesne, Insignia and others by default track the channels and apps you watch. What you give up: More-targeted ads in Roku menus. Roku won’t actually stop collecting data, though. — Cable services also often track the programs you’re watching so they can target ads. For Comcast, the largest cable company, turn off the targeting on the Web by logging into Xfinity.com or use this link, then going to My Account, then finding Alerts and Ad Preferences, then scrolling until you find Cable Targeted Advertising, tapping Edit near it, and then clicking Opt out and then Save. Other cable companies have a similar functions with slightly different names. Spectrum from Charter calls it Additional Marketing and Targeted Television Ads or try this link. Verizon Fios calls it Relevant TV advertising. Here’s my job evaluation for LinkedIn: Office busybody. Based on the assumption that you want to broadcast your professional life, the social network’s defaults expose a lot. LinkedIn has some 60 data, privacy and advertising settings you can control. 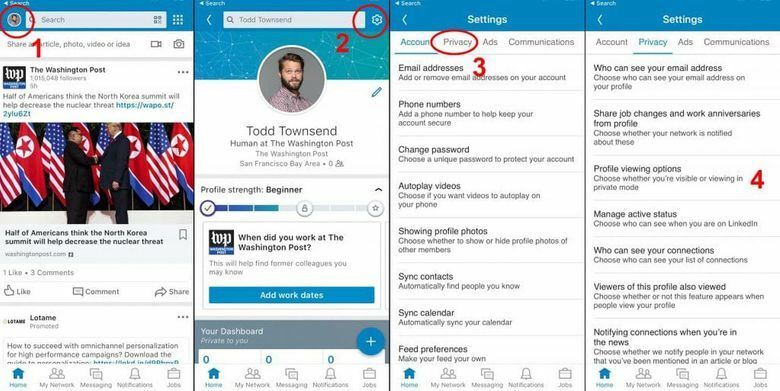 To get to them on your phone’s LinkedIn app, tap your picture in the upper left corner, then the gear icon in the upper right corner. On the Web to this link or go from your home screen to Me, then Settings. Scaling back this information is most easily done on the Web. Go to LinkedIn, find Settings and then Privacy, then click on Change next to Edit your public profile. There you can turn off your public profile entirely and choose which details you’re comfortable sharing. What you give up: There will be less info about you out there for ex-colleagues and would-be employers to find – as well as aggressive salespeople, crooks and stalkers. — Every time you look at someone’s LinkedIn profile, LinkedIn tells them you were there. Make your visits anonymous by going to this link or in the app from Settings to Privacy, then tapping Profile viewing options. There, switch to Private mode. What you give up: Once you go private, you won’t be able to know who looked at your profile, either – unless you pay for a premium LinkedIn subscription. — Every time you make an edit on your profile, LinkedIn broadcasts the change to your connections. Turn off the oversharing by going to this link or to Settings, then Privacy, then click to change Sharing profile edits, and toggle it to No. What you give up: Connections might miss an important update like a promotion – but you could always just turn this back on temporarily for a change you do want to broadcast. 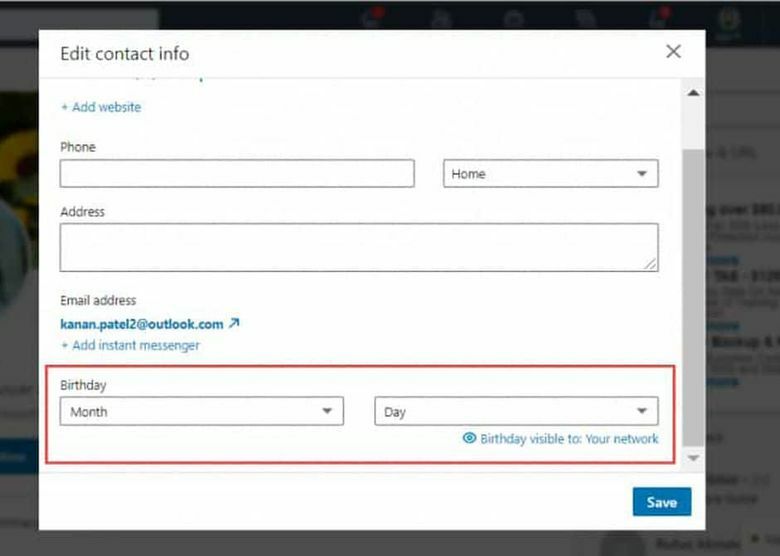 — LinkedIn pings your professional connections when it’s your birthday, too. Why on earth? Turning this off requires changing the visibility of your birth date in your contact info. This one involves a lot of clicks: On the Web go to the Me icon on your LinkedIn homepage, then View profile, then See contact info. In the window that pops up, click Edit, and there under Birthday, set it as visible to Only you. — LinkedIn by default targets ads at you based on the personal data you enter and also by tracking other websites you go to. It even uses your data to target ads you see outside of LinkedIn. Scale back access by using this link or by going from Settings to Ads in the app. There, I recommend switching most of the choices to No, including Insights on websites you visited, Ads beyond LinkedIn, as well as the many specific categories of data collected on LinkedIn (Connections, Location, Demographics, Companies You Follow, etc.) and towards the bottom, Interactions with businesses. — LinkedIn can use your name and photo in ads you see. Who thought that was a good idea? Use this link or under the Ads settings, switch off Profile data for ad personalization. Unlike other social networks, most people assume what they do on Twitter is public. So maybe you’re not surprised to know that it’s in the business of selling your attention to advertisers, just like Facebook and LinkedIn. – – By default, Twitter will try to target ads to you based not only on what you do on Twitter, but also your activity outside the social network, including information it buys from data brokers. Three defaults worth changing in Yahoo’s privacy settings. — Yahoo tracks what you do across its sites and services – including the content of your email and messenger communications – to, you guessed it, target ads at you. What you give up: You’ll see more generic ads, but not fewer ads. — Yahoo is tracking your precise location from its apps and websites. — Yahoo is following you across the Web to provide “personalized experiences” on other sites and – surprise, surprise – deliver more targeted ads. — AT&T by default enrolls customers into what it calls a Relevant Advertising program that uses a broad report of your location (such as your Zip code) and other data to let advertisers target you in websites and apps you see on your phone. 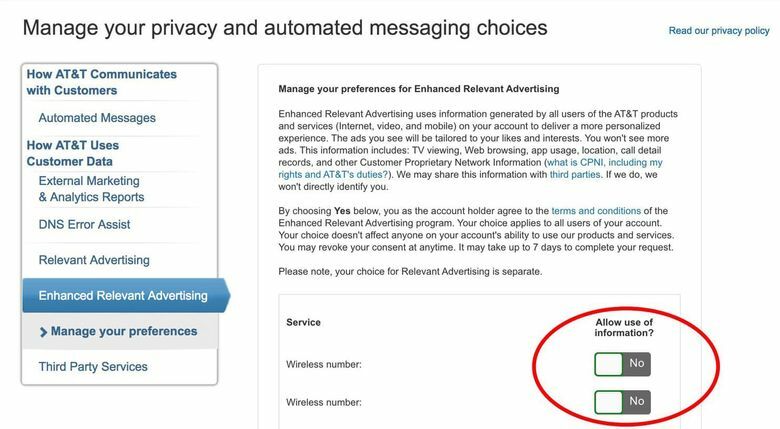 AT&T also tries to convince you to click yes – it had even gotten me – to opt in to a program called Enhanced Relevant Advertising that tailors ads using more detailed information, including your Web browsing, app usage, and precise location. — Verizon’s data programs include a partnership with Oath that makes it easier for them to track you for advertising. It also has a business selling aggregated data from customers that includes the websites we visit, apps we use and the places we go. — T-Mobile’s data programs potentially allow advertisers and T-Mobile’s partners to target you based on your location, Web browsing and app activity. — Sprint wants to use data about the websites you visit, apps you use and broad location data for its so-called Mobile Advertising Program – but participation is turned off by default. Check your settings on the web by using this link, or by logging into your Sprint account, going to All about my account, and then tapping Manage mobile advertising and reporting preferences and making sure Do not use my info is selected. Here’s a concern that’s as much about security as it is privacy: The default administrator password for your home WiFi router likely is . . . “password.” That’s a problem because anybody within range could log in and change your settings – or, worse, hack into your devices. Many home routers come with generic passwords that they intend for you to change, even if most people don’t. This isn’t the password you use to get on the WiFi – it’s the control panel that runs your router. The most common is username: admin, password: password. One common way to access your router’s control panel is to join your home network, then type into a Web browser bar http://192.168.1.1/ If that doesn’t work, try http://10.0.0.1/ or http://routerlogin.net If none of those work, try Googling your router’s brand name and router login. Then log in – try starting with username: admin, password: password. If that doesn’t work, you might have changed your password at some point, so congratulations! Or it is possible your router has an unusual default password, so Google for your brand’s default admin password. Once you’re in, find your way to settings and change your password to something more unique. What you give up: Now there’s one more password you need to keep track of – which is why you should get a password manager, a topic for a whole other tech column. – With contributions from The Washington Post’s Hayley Tsukayama.